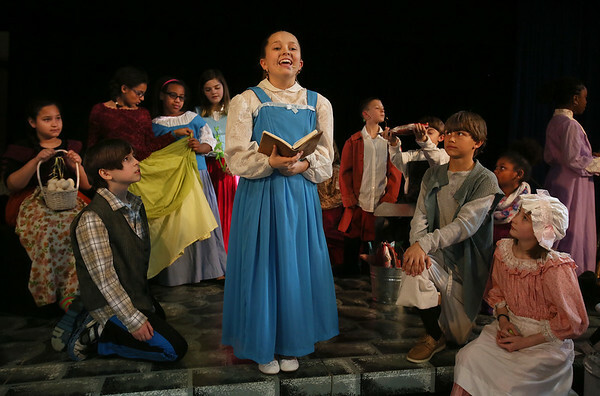 Fifth-grader Ella Anderson, center, plays Belle during a rehearsal for "The Beauty and the Beast" at Beeman Memorial Elementary School in Gloucester. Surrounding her are, from left, Yenery Peralta-Rodriguez, Gabe Gullett, Naveah Smith, Jazmin Baez Rivera, Grace Robbins, Jason Earl, Daniel Alves, Cooper Hedges, Nia Smith, Matilda Melvin and, in the background, Tolu Olubanjo. The play, directed by Heidi Dallin with musical direction by Beth Goldberg, will be presented to the public next Tuesday through Thursday, April 12-14, at 7 p.m. in the Beeman auditorium. The price of admission will be $5.